I was humming and hahhing about posting this today. The reason is that I’m not interested so much in Donald Trump the politician as in the character of the man, if the two can be separated in this case. Trump’s non-stop insults and threats tell us that he is full of uncontrolled malice toward others, and a bully. No wonder people’s reaction to him. Her words reminded me of other, unsavory actions and words I have witnessed during Trump’s campaign. To me he seems to be lacking in empathy and he clearly has an enormous ego. But call me naïve, Meryl Streep’s comments made me wonder if he simply just lacks good manners? The particular incident that Streep referred to sounds like something from kindergarten. I’m not going to voice my opinions of him as a politician, but if all that was at stake in Trump’s insults was bad manners, that would still be regrettable. Good manners are about respect for other people, and surely a president should be respectful. So, are good manners important? For me, good manners refer to polite and good social behaviour. Good manners lay the foundation of stable social patterns and imply certain values of human relationship that keeps society alive and kicking. Good manners imply stable values. Values like respect, loyalty, kindness, concern for others or even obligation are fundamental to our social and family rules of conduct, which have been determined by our respect for such values. Besides, good manners are an indication of the degree of refinement whether in an individual, a society or a nation. I believe that good manners are closely linked to moral values, and that good manners are very important for success and a happy life. It is the crux of a healthy human relationship. 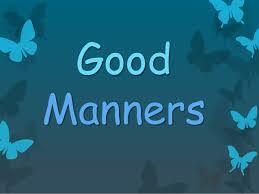 Good manners imply a certain level of sensitivity for the feelings of others. An awareness, and respect that is necessary when dealing with people from all walks of life. It takes so little effort to remain polite, to listen, and wait. It’s what we all want from others, and others deserve from us. Thanks Angelina, this is a welcome conversation during these very difficult times. Hello Susan, thank you so much for taking the time to comment here. I couldn’t agree with you more. Another point about good manners is that it makes the world a more pleasant place to be, don’t you think?